Kashabba Tribe Ministries is honored to partner once again with our good friends at Fatherhood Ministry in Rwanda to see transformation in the church and outside of it through the Gospel of Jesus Christ. In September 2016, a door was finally opened after years of dreaming together about the possibilities of what God desired to do in Musanze, in the Northern Provice, and in Rwanda. 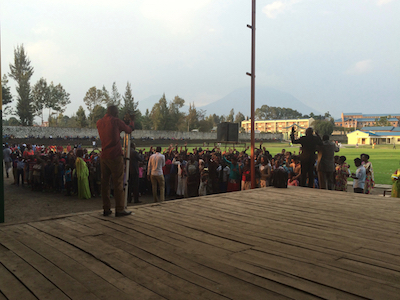 We have always seen an increase through partnership, and believe there is even more for the city of Musanze to come. Through our friends, we’ve been invited by these leaders in this region to come with a team that will teach on and model the ministry of Jesus. The plan is to continue to Kingdomize pastors and leaders through a multi-day Leaders Conference and then have a multi-day open-air crusade in the soccer stadium so that all the people of Musanze will see, hear, and experience the power and love of our Living God. In addition, we will be ministering to the orphans that Fatherhood Ministry supports and takes care of while also having opportunities to minister in the regional hospital, School for the Blind, other schools and more. Once again this ministry trip will have something for everyone and be an incredible adventure as Kashabba Tribe Ministries goes beyond the borders of Tanzania again to continue blessing what the Father is doing in Rwanda. Whether it’s watching thousands of folks experience the Kingdom of God in the open-air or loving on the “forgotten ones,” there is truly something for you. We are looking for a large team to come and set Musanze into a Holy Ghost commotion as the name of Jesus is lifted high while the residents of Musanze continual encounter the Risen Christ through various points of contact. Come and be part of the renewal and transformation of Nothern Rwanda!